This children’s book is a delightful collection of brief stories from Greek and Roman mythology to illustrate the origin of common words and phrases in our vocabulary, such as hypnotize, Achille’s heel, nemesis, and others. Beautifully illustrated, the book combines excellent and simple renditions of the myths, as well as the usage of the word today. 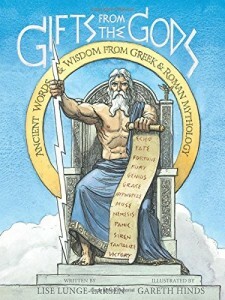 The book would make a great complement to the study of Greek and Roman myths, which is a standard part of the Waldorf curriculum. It would also make a wonderful contribution to Language Arts curriculum. I see it used best as a children’s book for grades 4 through 6. The back matter in this children’s book includes a very useful glossary of the names of the Gods and Goddesses in both Greek and Latin. It is a great way to show how different archetypes show up in a variety of cultures, with different names but similar stories. If your child has an interest in language and mythology, then this is also a wonderful children’s book for your home library.